This document describes the XML schema for the Sitemap protocol. Begin with an opening <urlset> tag and end with a closing </urlset> tag. Specify the namespace (protocol standard) within the <urlset> tag. Include a <url> entry for each URL, as a parent XML tag. Include a <loc> child entry for each <url> parent tag. All other tags are optional. Support for these optional tags may vary among search engines. Refer to each search engine’s documentation for details. The following example shows a Sitemap that contains just one URL and uses all optional tags. The optional tags are in italics. Adds features that cater to new scenarios or scenarios that were difficult to support. Reduces the amount of work required to develop providers. Supports more data sources with new built-in providers. Simple Providers: Reduce the amount of work required to develop providers, especially when the data source has very few synchronization-related capabilities, such as change-tracking. The goal is to enable a developer to write a provider without having to become a synchronization expert. The majority of the code that is required for a simple provider is limited to that responsible for interacting with the data source. Simple providers support many complex synchronization scenarios, such as filtering, concurrency and constraint conflict handling, and anchor-based enumeration. Flexible Filtering: Change unit filters and custom filters have been added to the custom provider components. These filters, in addition to the item filters from Sync Framework 1.0, enable you to filter your data in whatever way is most useful. Filter negotiation allows the source and destination providers to negotiate the filter used during the synchronization session. Change unit filters enable a provider to specify that, while the replica it serves stores all items in the synchronization scope, the replica stores a reduced representation of each item. For example, when an item is a contact a device might store only the name and phone number of the contact as compared to the complete contact stored on a PC. Custom filters enable you to define a filter in whatever way is most appropriate, including filters that allow an item to move into or out of the filter as the item data changes. For example, a media storage device stores only songs that are rated as three stars or better. When the rating on a song changes from four stars to two stars, the song moves out of the filter. Filter negotiation allows a destination provider to specify the filter to be used by the source provider during change enumeration; the source provider can accept or reject a filter. If a source provider does not support the requested filter then the destination provider can choose to receive all of the data and do the filtering itself. Improved Conflict Handling: Additional conflict scenarios are supported, such as reporting constraint conflicts, managing logged conflicts, and resolving conflicts by using a last-writer-wins policy. Constraint conflicts are conflicts that violate constraints that are put on items or change units, such as the relationship of folders or the location of identically named data within a file system. Sync Framework includes components to help resolve constraint conflicts and apply the resolution to the destination replica. Conflict logging is enhanced by Sync Framework components that help manage the log, such as by removing obsolete conflicts. A last-writer-wins conflict resolution policy can be used to resolve concurrency conflicts (in which an item is updated by more than one replica) by keeping the most recently made change, regardless of where the change was made. Sync Framework supports this policy by enabling an application to retrieve the time a change was made on the source and destination replicas. The application can then compare the two times and apply the last change. Data Conversion between Providers: In some scenarios, synchronization providers synchronize the same type of data (such as sales data), but the data format that each provider requires is different. To address this scenario, Sync Framework enables you to implement interfaces that convert data to the format that each provider requires. In addition to data conversion APIs that can be used for any type of custom provider, Sync Framework also includes conversion APIs specifically for the file synchronization provider. Change Application Service: Increases the flexibility and usefulness of the change applier component of Sync Framework. By performing the same actions as the standard change applier, but in a more granular way, the change application service gives a destination provider the ability to use only the features that it requires. Tracing: Enables you to trace the execution of several components, which is useful during application debugging. This download provides the .tmf files that can be used to view a trace, flush the logger, and format the binary trace file. For more information about how to trace Sync Framework execution, see “Tracing Sync Framework Components” in the documentation that installs with the Sync Framework SDK. New Database Providers (SQL Server and SQL Server Compact): Enable hub-and-spoke and peer-to-peer synchronization for SQL Server, SQL Server Express, and SQL Server Compact. Sync Framework automatically creates all of the commands that are required to communicate with each database. You do not have to write synchronization queries as you do with other providers. The providers support: flexible initialization options; batching of changes based on data size; and maintenance tasks, such as metadata cleanup and server database restore. Robust Memory-Based Batching: Previous versions of Sync Framework and Sync Services for ADO.NET provided a way for developers to define their own batching logic but there were a lot of limitations, including significant complexity, excessive chattiness, out of memory issues, and restrictions on usage. Sync Framework 2.0 addresses all of these issues by providing a more complete and robust batching API. Developers no longer have to write batching logic themselves because Sync Framework divides changes into batches based on several properties in the API. Batches are now defined by memory consumption rather than the number of rows synchronized, which has eliminated out-of-memory issues for most common scenarios. Provisioning and Management APIs: Provisioning and initialization activities that were previously exposed only through Visual Studio tooling have now been added to the database provider APIs. This includes the ability to provision an existing database by adding the change-tracking tables and triggers that are required by Sync Framework. It also includes the ability to start with an empty database, create the user schema, and provision that schema based on another server or client database that has already been provisioned. Performance Improvements: The new database providers in this release have been thoroughly tested in large-scale scenarios in which a single server supports thousands of clients with hundreds of concurrent synchronization operations. This testing resulted in a large number of internal performance improvements that enable Sync Framework database providers to perform as well as other Microsoft technologies like Remote Data Access (RDA) while offering a wide range of capabilities that compete with end-to-end solutions like merge replication. Please continue to send us feedback about our tool, using the SyncToy – File Synchronization forum (listed below). Note: We’ve taken great care to ensure that this tool operates as it should, but it is not part of Windows and is not supported by Microsoft Technical Support. For this reason, Microsoft Technical Support is unable to answer questions about SyncToy. To speak to other users and contribute feedback about your experiences with SyncToy, please use the SyncToy forum at http://social.microsoft.com/Forums/en-US/synctoy/threads. Connect with up to 15 people in different locations and get your point across by showing them what’s on your screen. Share, review, and update documents with multiple people in real time. SharedView is easy to use, from anywhere, at a moment’s notice. Click here to learn more about the Microsoft SharedView. Allows user to test PCI Express cards on the ExpressCARD bus. JP3 — The 12 Vdc connector on the board can be used to supply power to the board. JR3 – The USB connector can monitor and capture traces from the motherboard using a LeCroy analyzer. Jumper JP2, JP4, JP5 – Control signals for the PCIe card bus, when shorted the signals are asserted. Jumper JP1 – is a bypass for the 12 Vdc power connector and when shorted holds the +12 Vdc input to the PERST circuit high. Turbocharge your creativity with DeckLink Studio, the SD/HD broadcast video card that costs hundreds of dollars less than standard definition solutions! DeckLink Studio features SDI, HDMI and enhanced analog connections, plus a built in hardware down converter, and an incredible 4 channels of balanced analog audio. DeckLink Studio lets you move seamlessly between SD and HD workflows for the ultimate in creative flexibility! The world’s most compatible 10 bit video card that works in SD and HD! DeckLink Studio includes SDI, HDMI and analog video, analog and digital audio, keying in SD, a hardware down converter all in a compact and incredibly low cost solution that’s perfect for broadcast editing, paint and design. DeckLink Studio supports both SD and HD and plugs into any PCI Express Windows or Intel-based Mac Pro computer. DeckLink Studio includes SD/HD-SDI, SD/HD component, composite, S-Video, 4 ch balanced analog audio, 2 ch AES/EBU, blackburst and tri-sync reference input and RS-422 deck control connections. Posted by John Ruby in Accessories, Hardware. The Cisco® integrated Cable high-speed WAN interface cards (HWICs) provide lower total cost of ownership, advanced quality-of-service (QoS) enforcement, and advanced monitoring and load-balancing capabilities for customers by optionally integrating a DOCSIS 2.0-based cable modem within a Cisco Integrated Services Router (ISR) or Cisco IAD2430 Series Integrated Access Device. Additionally, the new Cisco Cable HWICs greatly expand the portfolio of managed business-class cable services cable operators can offer to their small and medium sized business (SMB) and enterprise customers. The Cisco ISRs and Cisco IAD2430 Series can be coupled with the cable HWIC to provide a range of services, including security, IP Communications, switching, wireless LAN management and connectivity, WAN optimization, and much more. The new Cable HWICs (HWIC-CABLE-D-2 and HWIC-CABLE-E/J-2) are designed to comply with DOCSIS 2.0, Euro-DOCSIS 2.0, and J-DOCSIS 2.0 specifications and provide single-port cable modem connectivity for the Cisco modular integrated services routers and the Cisco IAD2430 series routers to the cable operator WAN. 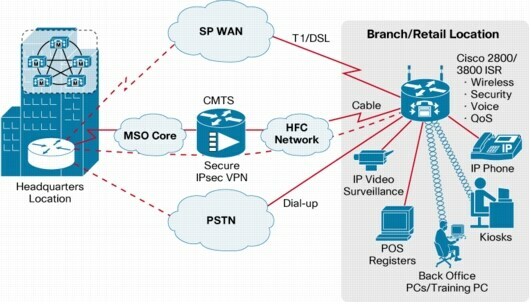 These cable HWICs (Figure 1), combined with the Cisco 2800 and 3800 Series Integrated Services Routers; Cisco 1841 and 1941 Integrated Services Routers and Cisco IAD2430 Series provide high-speed digital data transmission between customer premises equipment (CPE) and a central office. This enables cable service providers and resellers to offer additional services by supporting features for business-class security, voice integration, differentiated classes of service (CoS), and managed network access with Cisco IOS® Software. These value-added features, along with the manageability and reliability of Cisco IOS Software technology, provide the mission-critical networking that businesses require. In addition to being an excellent primary WAN link, the cable HWICs are well suited for used as a secondary WAN link for businesses of all sizes. This secondary link can be used to offload Web traffic directly to the Internet, provide a redundant option for a primary link in case of failure, or provide load balancing with a xDSL or other type of WAN link. Increasingly, Internet connectivity is crucial to a branch or small business employee’s productivity. However, as more streaming media and rich content is placed on the Web, the WAN bandwidth requirements to provide this connectivity continue to grow. In the case of a branch office, as shown in Figure 2, using Policy-Based Routing, all HTTP (Port 80) traffic can be diverted from a primary low-bandwidth link to the DOCSIS link to minimize the amount of traffic being routed back to corporate headquarters. The ISRs can optionally provide end-to-end security with advanced firewall, intrusion prevention, and URL filtering capabilities to help ensure security and proper usage of the Internet. As more business applications are centralized, connectivity to the central or regional office becomes crucial to the growing population of workers distributed among branch offices around the world. Cable broadband provides an excellent backup to traditional public switched telephone network (PSTN)-based WAN links because it uses a separate network infrastructure. This separation helps reduce the probability that if the primary PSTN-based WAN link goes down, the backup link, which would often otherwise reside in the same binder as the primary link, will simultaneously go down as well. The ISRs can create IP Security (IPsec) tunnels back to the central site to secure any mission-critical communications until the primary link is restored. Additionally, the high performance capability of the cable HWIC makes it an excellent backup option for newer high-speed technologies such as ADSL2+ and Ethernet WAN services. Posted by John Ruby in Hardware, Home Media, Network.